The white March sisters experience family life in a New England town in this “modern retelling” of Part 1 of Little Women. Motherly, occasionally bossy Meg (13), temperamental, no-nonsense Jo (12), quiet, shy Beth (10), and effervescent, artistic Amy (9) live with their mother, a community-center director, and her friend Hannah while their father’s serving overseas. Meg tries “to set a good example and…keep her sisters in line.” Jo writes in her attic lair, plays hockey, and befriends olive-skinned neighbor Laurie. Beth practices piano and bakes cookies. Amy’s impetuousness earns her detention and Jo’s wrath. Dark days arrive when Mr. March is injured and Beth contracts the flu. Throughout, the sisters are guided by their mother’s moral compass. Although three years younger than their originals, Schaefer’s sisters mirror Alcott’s in appearance and temperament. 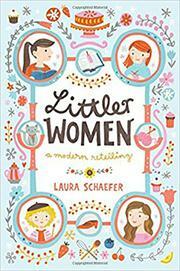 Aside from Alcott’s Civil War setting, Schaefer’s plot neatly parallels events in Little Women with modern accoutrements such as video games, cellphones, hoodies, and jeans. However, Schaefer’s version, though jazzed-up with references to modern kids’ books, recipes, and craft projects, pales in comparison with Alcott’s classic.